Product information "Ergon ST Core Prime Women M/L Touring Women's Saddle"
The ergonomic miracle of Ergon, specially developed for touring, ensures maximum long-distance comfort and comfortable sitting. Ergon uses a floating two-shell principle with ergonomic core to support the natural pelvic movements while pedaling. In addition, this design ensures medical back protection and reliably attenuates bumps. The saddle core is made of modern E-TPU with special material properties such as direct response and enormous restoring force. And the large discharge channel effectively prevents numbness and seat discomfort. The new ST Core Ultra saddle is designed for best Comfort on Trekking- or E-Bikes. 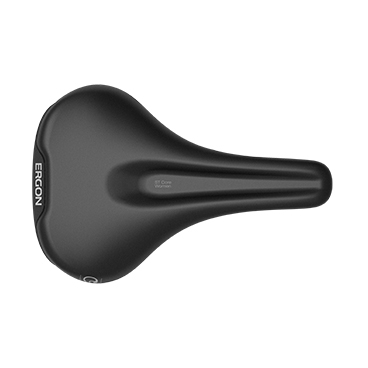 Related links to "Ergon ST Core Prime Women M/L Touring Women's Saddle"
Customer evaluation for "Ergon ST Core Prime Women M/L Touring Women's Saddle"